Here is the theology book you’ve been looking for! Published by Zondervan last year in spiral 8.5×11, this handy and concise book gives you a summary view of all the major Bible doctrines. 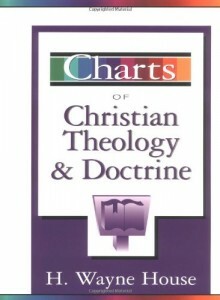 And since a picture speaks a thousand words, you get the same information in 140 pages of charts that you get in much larger theology books. Plus, it is up to date, organized in logical progression and easy to decipher. Where else have you found Black Theology listed with Feminist doctrine as a form of Liberation Theology? Side by side you get the various views of the Trinity, prophecies of Christ, Election, the rapture theories and even the sub-kenotic theories for the real diffuse reader! House is a former Dallas Seminary professor so the rapture, millennium and dispensations get a thorough treatment. The sections on sin and salvation are very complete and treat all views with equal time. Pay the $15.